This generous arrangement elegantly completes any celebration or get-together. Inside a cloth-lined basket, your recipient will discover a dense, complex Cabernet Sauvignon and a crisp, golden-hued Chardonnay, which are surrounded by an assortment of classic gourmet treats. Boasting aged Californian wine wafers, gently roasted Virginia peanuts, and a handcrafted summer sausage, this harmonious arrangement is the perfect compliment to any occasion. 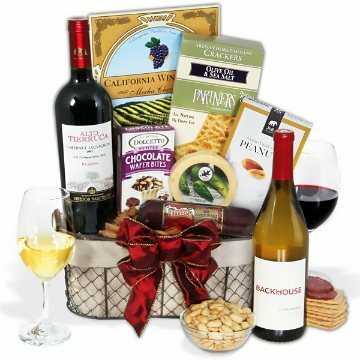 This gift includes the following: Cabernet Sauvignon Reserva by Alto Tierrucav - 750 ml., Chardonnay by Backhouse - 750 ml., Hors d'Oeuvre Deli Style Crackers - 4.9 oz., Hot Pepper Cheese Round - 4 oz., Smoked Sausage - 7 oz., Mocha Chocolate California Wine Wafers - 2 oz., Roasted and Salted Peanuts - 2 oz., Chocolate Wafer Petites - .7 oz.